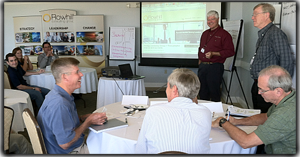 Wrightsville Beach, NC – Rowhill Consulting Group concluded their first leadership development workshop of the year with great success. Leaders from throughout the Southeastern United States attended the program with alumni of Rowhill programs and new attendees alike. The workshop represented various industries, such as medical science, finance, technology, and engineering sectors. This diverse classroom of leaders allowed for a truly unique learning environment that fostered growth within the participants. Jim Sheegog and Ken Graham would like to congratulate the attending leaders on their great personal and professional development accomplishments over the course of the seminar and look forward to continuing the learning process through post-seminar virtual coaching. Based on the feedback from participants, Rowhill will be making further improvements to the course content and scheduling. As a result, the September 11th – 13th workshop will consolidate the first afternoon, making the now 2 ½ day workshop flexible for demanding schedules.